It’s now February—the time when “cuffing season” reaches its peak. I mean, it seems pretty natural to feel the need for a cuddle buddy, especially in the cooler months of the year. Experience the warmth and get over this season with the Newlywed Diary series. Although the program broadcasted two years ago, the show still leaves a cozy impression on viewers, wrapping the audience in a blanket of comfort. Produced by Na Youngsuk, the series reflected his unique style of variety shows. Falling more in line with the Three Meals A Day concept, Na Youngsuk had in mind the naturalistic viewpoint of a certain topic. This time around, the producer settled upon conveying relationships between people. Aiming to express the life of married celebrity couples in a reality show manner, the producer set the couple to live in a cozy home in the midst of nature and away from the developed industrial cities. By aesthetically filming the daily life of a married couple, the producer succeeded in showing the emotion of happiness one can experience through the smallest details in life. Needless to say, the first season of Newlywed Diary was a success. Starring Goo Hyesun and Ahn Jaehyun, the couple’s affection towards each other was depicted through the show, receiving endearment and support from the audience. The famous actor and actress first met through the drama Blood and transitioned from their status as co-workers to lovers. After a year of dating, the couple eventually entered into marriage in 2016. The show illustrated the true reality of a newlywed couple’s life. Unlike other shows that highlight the idea of pairing celebrities and creating imaginary couples, this program emphasized the realistic aspect of a budding romantic relationship of a married pair. With the show solely based on the incentive to reveal Goo Hyesun and Ahn Jaehyun’s true couple moments, interactions between the partners were obviously hard to miss. The pair demonstrated the genuine love they have for each other in many different ways, from responding to the smallest actions or comments to straightforwardly expressing their affection. Though not every single minute was a purely tender moment, the realistic interactions between the two lovers allowed the audience to feel more connected with reality. The chemistry of the adorable couple melted the viewers’ hearts. A distinct difference between the first and second season of Newlywed Diary was the fact that the latter featured an additional married couple. Starring Oh Sangjin and Kim Soyoung, as well as Jang Yoonjoo and Jung Seungmin; the two couples definitely showed off their own charms and chemistries. Let’s take a look at each couple! First up is the Oh Sangjin and Kim Soyoung pair. Both partners, with their common career as announcers, stepped into the married life in 2017. 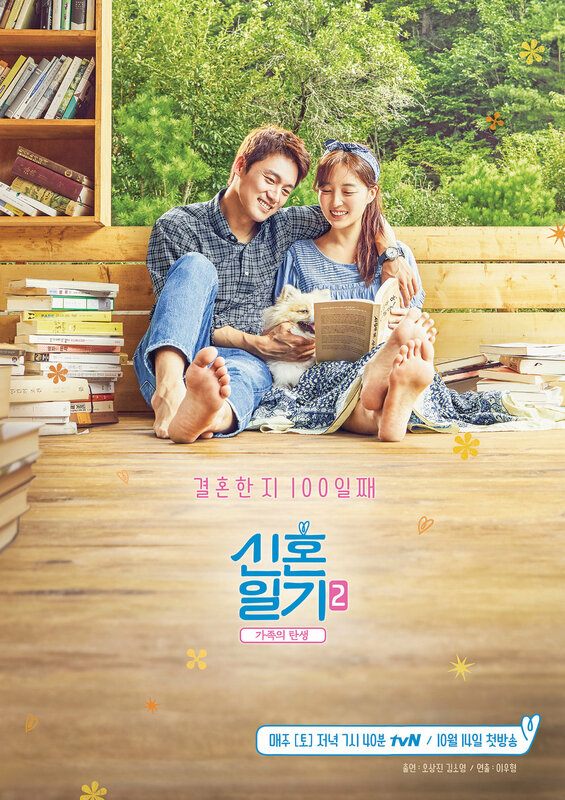 This pair really fits the title of the show as a newlywed couple as they were into their 100th day of marriage at the time of filming the show. As much as the pair was newly introduced to the ways of life with the status of being married, they seemed more like a couple dating, making the fact that they are married less distinguishable. The fresh and innocent vibes the lovers gave off succeeded in catching viewers’ attention and aroused heart-fluttering emotions of love. Similar to Goo Hyesun and Ahn Jaehyun from Newlywed Diary Season 1, not all parts of married life for Oh Sangjin and Kim Soyoung were full of joy and affection. However, the process the couple took to reconcile and once again embrace each other for who they are really played a big role in portraying reality the way it is. Rather than fluffing up the romance, the show does a good job at implementing the message that genuine love for one’s significant other conquers all. Next is Jang Yoonjoo and Jung Seungmin, who have been married since 2015. This pair is obviously a lot more experienced in marriage than the other two couples in the sense that they took on an additional role other than wife and husband in their relationship. The additional responsibility of becoming parents was indeed overwhelming at first, but the lovely couple was able to enjoy their marriage with the birth of their precious child. With the pair’s words and expressions, it can be seen that the lovers are truly fond of one another, and viewers—in response to the affectionate scenes such as cuddling or hugging—instantly see the love radiating from both partners. It’s a great idea to stay warm inside watching the Newlywed Diary show. Tune in and stream the show on Viki and feel the wave of heartwarming emotions from the married couples’ loving relationships.